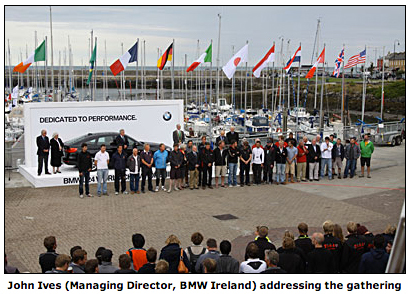 The BMW J24 World Championship was officially opened by the Mayor of Fingal Cllr. Kieran Dennison at a ceremony on Saturday evening attended by 200 sailors representing 10 countries who were led by a piper on to the club forecourt in front of the podium. Organising Committee Chairman Derek Bothwell introduced the speakers – John Ives (Managing Director, BMW Ireland), Berchmans Gannon (on behalf of ISA President Niamh McCutcheon) and the Mayor, before welcoming individually each skipper by name. After days of registration and measurement, the 40-boat fleet has a practice race on Sunday followed by two races a day from Monday (26th). Forecast is for light winds for the championship.